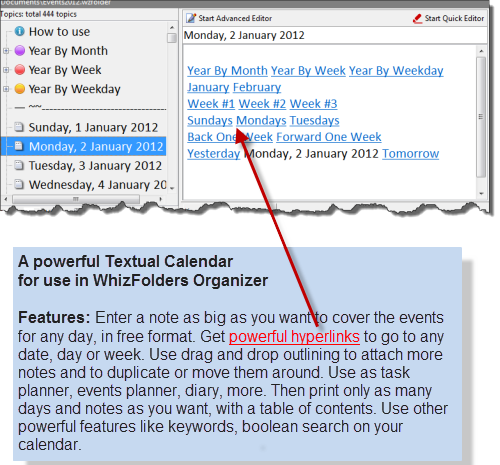 To use this Calendar File, you need to download and use WhizFolders Notes Software from WhizFolders.com. You can use this calendar file as a daily notes diary or as a journal with easy links to jump to any other day, week or month easily to review your diary. If you are already using an older calendar file with WhizFolders, you can straightaway download the new year 2018 calendar file from the link given at the end. Many uses of this file: You can use this WhizFolder file as a calendar, diary, journal, events, tasks or for any free format note taking related to dates. Further, you can use it with any WhizFolders edition (even the trial edition). You can feel the power of WhizFolders hyperlinks and free format concept when you start using it. Please look at the tips in the “How to use” topic at the top of the file. Download: You can download the 2018 year file from the following link. Read the important note on downloading below.